Nothing says “Summer” like a fresh bowl of delicious blackberries. If you haven’t tried this, then you are missing out! Not only are they super easy to eat, but they help your body in amazing ways. Did you know a blackberry is not just one fruit. Actually each blackberry consists of around 90 small drops that are arranged in a circular way. Blackberries grow in different types of soils. They are more available during spring and summer time. 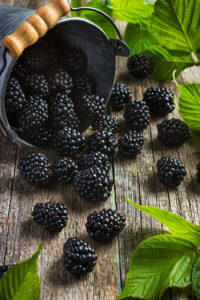 Blackberries have a sweet and tart flavor that makes them perfect for a fruit salad or vegetable salad. They are also delicious as topping for yogurt or blended in smoothies. The best part is blackberries are also delicious by themselves! You can eat blackberries as a snack anytime of the day and not only will they fill you up, but they will fill your body with a lot of health benefits. Blackberries have one of the highest antioxidant contents per serving of different foods. These antioxidant properties protect your body in multiple ways. For instance it will help in cancer prevention, heart health, and it helps in brain function. Eating blackberries each day will help improve the cognitive functions of your body. It enhances your memory and performance and improves neuron functions. Blackberries improve the flow of your brain, making it easier for you to recall new information. Blackberries help you have a healthy heart. Components such as magnesium and fiber make your blood flow more smoothly. This reduces the risk of stroke and other heart diseases. 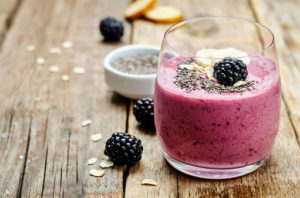 Add blackberries to your smoothies, yogurt, and your heart will thank you for it. Blackberries help improve your immunity due to different vitamins and minerals it contains. Consume blackberries regularly and your body will feel protected against infections and illnesses. Blackberries are a great snack when you are trying to lose weight. With few amounts of calories, it makes it great for your body to fill full, yet you will be eating very healthy. Our skin plays a crucial role in how we look. Many times we put chemical products in our skin to make us look better, but this might hurt our skin more than help it. Blackberries have a high amount of vitamin A and C, which help your skin look beautiful. The high levels of antioxidants will also make your skin glow. Blackberries are packed with nutritious vitamins and minerals. These help you maintain eye health. All the elements in blackberries help prevent many disorders that can eventually lead to impaired vision or even blindness. Even though blackberries are tiny, they have a powerful effect on your bones. Research has shown that berries protect your bones from stress and from damage. Increase your consumption of blackberries and you will protect your body against bone lose. Blackberries are super beneficial for your body. With a low amount of calories, high amount of vitamins and minerals, blackberries are essential in your diet. This summer go out and enjoy blackberries! Eat them in a yogurt parfait, in a delicious smoothie or even a salad!